Becoming a full-fledged member of the Jewish community is a time-honored tradition that makes parents proud of their son. The Bar Mitzvah Event Planner is the perfect tool to help you plan the perfect event to go with it. No matter your budget, this free template document will help you get the most bang for your buck and celebrate this momentous occasion in style. The free document is the best way to go through all the elements of a Bar Mitzvah and actually put together how the event will go. Not only do you have a handy budget with this template, but you also have a space to schedule all the events that go along with the celebration too. 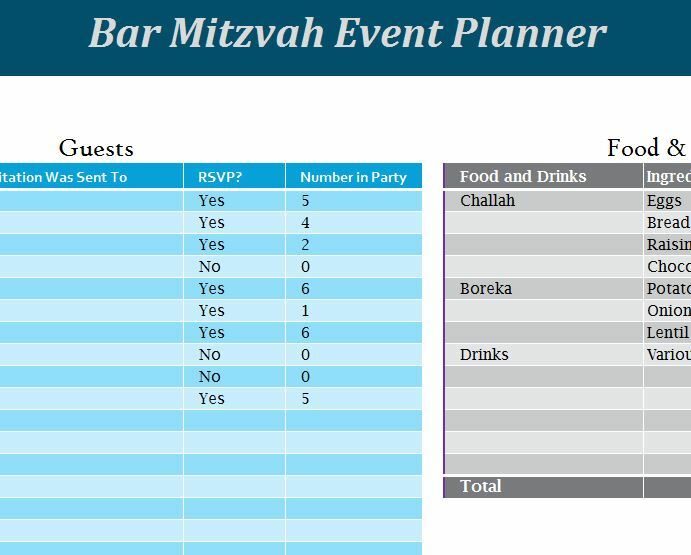 The first step will be to download the Bar Mitzvah Event Planner template directly to your computer by following the link at the bottom of this page. Now, go to the “Bar Mitzvah Event Planner” tab, located at the bottom of your screen. Here, you will see the structure of the template and how to enter each piece of information as well. Start by listing the guests, their contact information, RSVP, and the number of people that will be in their party, in the blue box to the far left of this page. At the bottom of the blue table, you will also see a running count of all the guests that will be attending the celebration. Now, go to the gray tables to the right of this page. Here, you will list the various expenses associated with a Bar Mitzvah. You can also change the sections or the items within by clicking a cell and entering something new. These tables will also keep track of the totals. This way, you can stay up-to-date on the amount you’re spending for the entire event. Finally, go back to the “Summary” tab, where you will be able to browse all this information as an overview. You can plan the perfect party for your boy’s special day, download the free template now.